What on God’s green earth was he thinking here? Uefa looks set to launch an investigation into goings-on at Everton after a fan carrying a child appeared to aim a punch or slap in the direction of Lyon goalkeeper Anthony Lopes following a mass brawl between both sets of players. The incident was sparked by a challenge from Toffees defender Ashley Williams on Lopes after the keeper caught the ball. Lyon forward Bertrand Traore was the first to confront Williams, with several other players following suit. 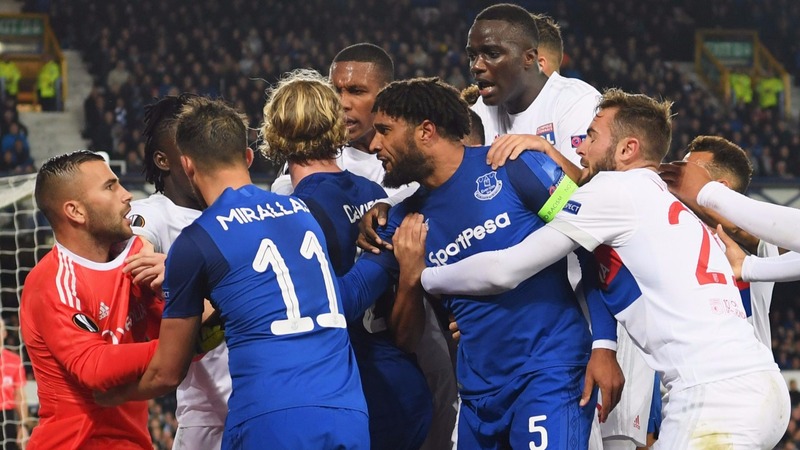 The melee soon moved over towards the advertising hoardings, with several Everton fans weighing in with shouts and gestures aimed squarely at the Lyon contingent. One fan, carrying a toddler, took things a little further though, storming over towards the mass of players and seemingly aiming a punch or slap in the direction of Lopes. The Lyon players were quick to react with angry disbelief at the encounter, which was equally astonishing for anyone watching. Despite several players getting involved in the ensuing scuffle, Williams and Traore were the only ones to be reprimanded, both receiving yellow cards for their trouble. Commenting after the game, Lopes was keen to play down the incident. “I don’t think it is part of the English atmosphere to hit an away player. I am proud that we were strong at 1-1 and we won the game despite everything,” he said. Everton has since confirmed that the fan involved has been banned from Goodison Park for life. “Club Officials have reviewed the footage of an incident that occurred in the 64th minute of the game against Olympique Lyonnaise where supporters towards the front of the lower Gwladys Street End became involved in a confrontation between players,” the statement read. The incident came towards the end of a frustrating night for the hosts, who lost 2-1 to Lyon and look increasingly likely to be facing an early exit from the competition.